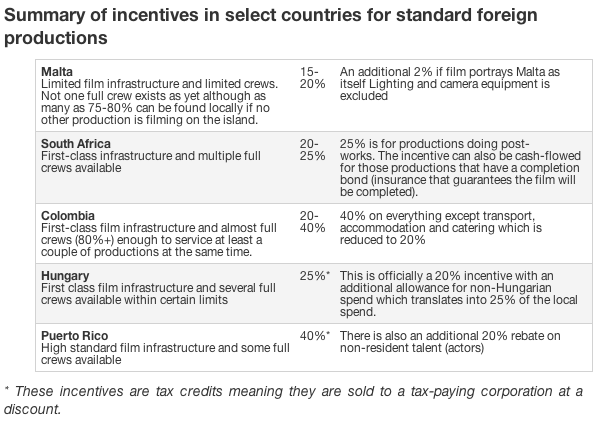 Malta needs to improve its financial incentives if it wants to keep foreign film productions coming to its shores. Malta’s true ‘unique’ asset remains the water tank facility at Rinella...In today’s day and age, more films are having their scripts modified to fit the country that makes the most economical sense to producers. Obviously, some films having heavyweight and influential directors which still allow creative reasoning to override the economical benefits. But never before is this industry giving so much attention to the hard cash returned by different countries. Some Hollywood studios, in fact, have their own departments set up solely for researching incentives around the world and processing paperwork once decisions are made. Malta needs to better its incentives not simply because other countries are also doing the same, but also because the country is burdened with the disadvantage of being an island, with certain limitations that lead to direct and indirect costs. These include costly construction materials, travel and living costs for foreign crews. No longer can Malta boast that it has an abundance of unique locations “untouched by tourism” (look at Fort St Angelo’s wharf, for example) although some areas like Dwejra and Mdina are, fortunately, still Mediterranean treasures. In any case, locations are no longer the main driving force for decision-makers in Hollywood. Incentives are. Malta’s true unique asset remains the water tank facility at Rinella, which, so far, remains a world leader in water special effects filming, partly due to the incentives in place. However, filming on locations (outside the water tanks) in Malta is weighed much more carefully against the incentives on offer. Malta offers up to a 22 per cent cash rebate on money paid to Maltese or EU entities such as crews or suppliers. Still, there are significant exclusions to certain expenditures. Moreover, most productions qualify for a maximum of 20 per cent. As one studio executive said, when comparing Malta with Turkey (his film is supposed to take place in Cyprus), why film on an island where he would have to take anywhere between one fourth and one half of his crew, perhaps even more, depending on what other films are shooting at the time. And where there are no proper sound stages and where competitive equipment houses are limited? Other neighbouring countries offer cheaper materials and labour, more crews and a better film infrastructure. This studio executive was not bothered by the fact that actors and crews usually have a better time living and working in Malta. It’s the bottom line that he cares about as, indeed, most other executives do nowadays. Malta can bury its head in the sand and believe that it is truly a unique island where film-makers will bend over backwards to go and return time and again. The reality is, however, very different. South Africa, a country already thriving marvellously as a foreign film destination, recently raised the incentives it offers to 20 per cent without any exclusions or small print conditions. This goes up to 25 per cent if post-production works take place in the country. Films structured as a co-production benefit from nearly 30 per cent. Colombia will introduce a cash rebate in January 2013 that will average out to 30 per cent. Puerto Rico already offers 40 per cent plus an additional 20 per cent on non-local acting talent. Hungary’s incentives are structured to offer the equivalent of 25 per cent. Malta’s rebate is structured in a simple form: a cash rebate as opposed to a tax credit. Also, the process is usually straightforward as long as the administrators are not “overloaded”. But the island needs to be more aggressive to offset the disadvantages of its “island issues” and its lack of infrastructure. Malta should be offering 30 per cent and no departments should be excluded as these are only seen as significant disadvantages. Once the local infrastructure and crew base builds up and solidifies, perhaps in another five years, the government can then consider tightening the belt and reducing incentives. It would be good if Malta can negotiate with the EU so that more Maltese costs (rather than EU costs) can be eligible for the cash rebate. This would encourage producers to tap deeper into Malta’s resources and eventually stimulate more growth in the local infrastructure and human resources. Admittedly, this is a double-edged sword because making EU expenditure eligible also encourages producers to close an eye to the island’s shortcomings within the industry. Moreover, differentiating between Maltese and EU costs can lead to violations in the EU’s policy on state aid, although, a few years ago, Hungary seems to have negotiated more favourable terms than Malta. The EU expects the Malta Film Commissionto respond to its proposed new draft on state aid. Malta had dragged its feet for years before introducing incentives in 2005. These proved to be very effective, translating into a big boost in foreign film productions and millions of euros injected into the economy. It is now simply a matter of moving with the times in order to remain in the game.